Digital Lighting Systems manufacture a very broad spectrum of reliable solid state lighting flashers, sequencers, chasers, faders and dimmers for the Sign, Casino and Entertainment industries, Spellers and Sequencers for signs, Four-circuit marquee chasers, multi-circuit and multi-pattern chasers. LAS VEGAS type sign animation controllers. Fountain, Pool and Spa lighting color-mixing. Controls line voltage and VDC LED lights. All these lighting controllers have standard sequences but could be preprogrammed to become Spellers with the customers defined patterns and sequences. Our solid state flashers, chasers are a reliable & inexpensive replacement for mechanical flashers, sequencers or spellers made by FMS, Signatrol, Rocox, American lighting or others, (no mechanical parts to fail or contacts to wear) for trouble free operation & more animation features. Chaser4 1 pattern ( 1 light ON ) 2,3 or 4 channel user selectable lighting chaser for marquees & other lighting sequencer applications. MCFseries Multi pattern ( 14+ Auto ) 2,3 or 4 channel user selectable lighting chaser for marquees & other lighting sequencer applications. A compact and economical lighting chaser "flasher" with 16 patterns and variable speed. 4 x 2.5 Amp capacity at Line and Low-Voltages. 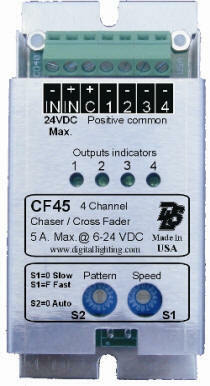 Capacity increases to 4 x 7 Amps when Single Lamp Chase pattern is selected ( 1 ON, 3 OFF ). Capacity may increase to 4 x 7 Amp with Single Lamp Fade pattern selected. Capacity may also be increased by adding slaves. 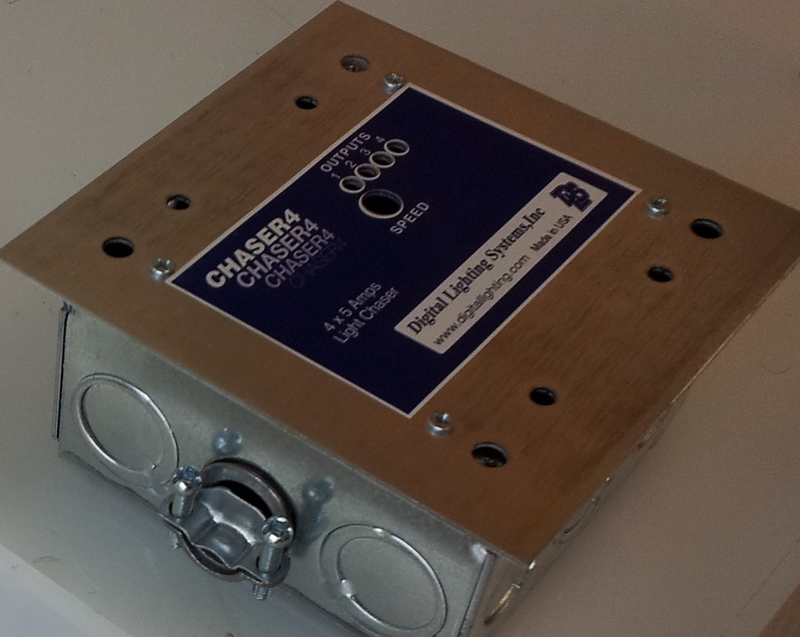 High & Low Voltage Light Chaser available in 12V, 24V, 120V and 220V versions. 4 x 8 amp outputs (40Amps triacs), 16 exciting patterns. Same as SC , Light Chaser with Cross-Fading available in 12V, 24V, 120V and 220V versions. 4 x 8 amp outputs, 16 exciting patterns. 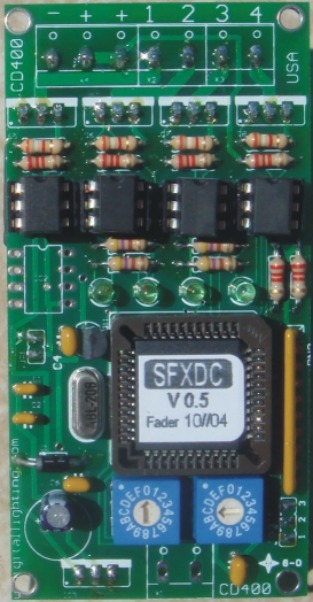 3 or 4 channel fader (auto dimmer ), Chaser. Voltage range 6VDC to 24 VDC. LED color mixing and chasing. Controllable from standard 1-10V sinking or sourcing wall dimmers and controllers or usable as stand alone with 100 Kohm Potentiometer. 4 channel PWM dimmers repeater / amplifier. 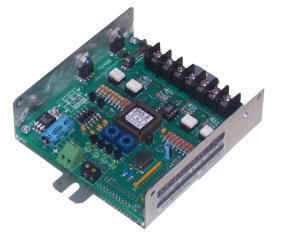 Could be used with any of our DC voltage controllers and dimmer packs. Digital Lighting Systems,inc., a member of the American Lighting control industry since 1978, manufacture a variety of self contained lighting automation controllers (Flashers, Sequencers, Spellers, Chasers and Faders) are used in a variety of applications (for animation systems with remote controllers please see our DMX-SERIES pages). They are designed to handle most types of low-voltage and high-voltage loads including linear architectural lighting, incandescent, cold cathode neon, LED's and fluorescent lighting. You will find our off-the-shelf controllers adequate for most requirements. We also design and build custom lighting controllers with up to 512 channels to specific customer specifications (also see our DMX-SERIES pages). Our prices are extremely competitive and our quality, service and customer support are unsurpassed in the industry. All of our controllers are non-mechanical and are built using durable Solid-State technology. They can work on either 60 or 50 Hz and are available in 12VAC, 24VAC, 120VAC and 220VAC. Our BC-SERIES & MF SERIES chase controllers are available for DC Voltage operation also ( LEDs and Other DC light sources ). Controllers suitable for dimming or switching incandescent, low-voltage, LED, neon, fluorescent and motorized loads.